An Alabama Nissan dealer is selling a Mercedes-Benz G-Class SUV that they’ve just received as a trade in from Tim McGraw and Faith Hill. 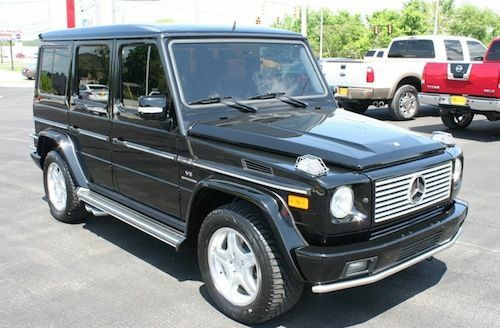 Are you in the market for a lightly used Mercedes-Benz G-Class once owned by country music's most admired power couple? Well you’re in luck because Tim McGraw and Faith Hill’s black 2005 Mercedes-Benz G55 SUV has just made its way onto eBay. The duo’s former ride features a 5.5-liter supercharged engine, an automatic transmission, 4WD, moonroof, heated seats, navigational system, alloy wheels, a clear title, and just over 30,000 miles. According to the listing, the vehicle was stored in a garage and contains no visible damage or defects on the vehicle’s exterior. The Mercedes-Benz SUV boasts an extra clean interior, with no signs of rips, odors or abuse. Additionally, there is approximately 75 percent of tire tread remaining. The listing requires a minimum starting bid of $54,000 and features a But It Now price of $64,990. There are currently no bids, with five days remaining before the listing expires. The winning bidder must contact the seller within 24 hours of auction end to make payment arrangements. A $500 non-refundable deposit is required within 24 hours of auction’s end; the remaining amount is due within five days. Click here to view the vehicle’s listing on eBay. An Alabama Nissan dealer named Nissan of Gadsen is responsible for the vehicle’s listing. According to the dealer, McGraw and Hill traded in the vehicle for a new car for their daughter. In April 2012, McGraw turned to eBay to sell his metallic black 2006 Dodge Charger SRT-8. McGraw acquired the muscle car in 2006 and later had its engine tweaked to increase its output to 652 horsepower. The “Live Like You Were Dying” singer also added custom wheels and flames to the vehicle’s exterior. McGraw even autographed the vehicle prior to putting it on eBay. McGraw did not disclose the reason for unloading the vehicle. Despite selling numerous vehicles over the years, McGraw has refused to let go of his classic 1978 Jeep Wrangler CJ, which he received as birthday gift from Hill. Not your average Jeep, the couple shares a deep bond with the vehicle. In fact, the duo borrowed the SUV to go out on a date while touring in 1996. Incredibly, Hill managed to track down the vehicle nearly a decade later and give to McGraw as a birthday gift. Interestingly enough, Jeep served as the sponsor for McGraw and Hill’s 2007 Soul2Soul tour. The Jeep-promoted tour featured a limited edition “Soul2Soul” 2007 Jeep Wrangler Unlimited, as well as the couple's original “Date Jeep,” which traveled with the tour.